Single 10 Ball Mini Roman Candle – Don't let the size full you with these candles! These 10 shotters pack plenty of punch! Neon Roman Candles - Shoots 10 colorful neon balls. 5 Ball Roman Candles - Traditional roman candle, shooting 5 white flaming balls per candle. Color Thunder Roman Candles - 10 shot with 5 red stars with report and 5 green stars with report. 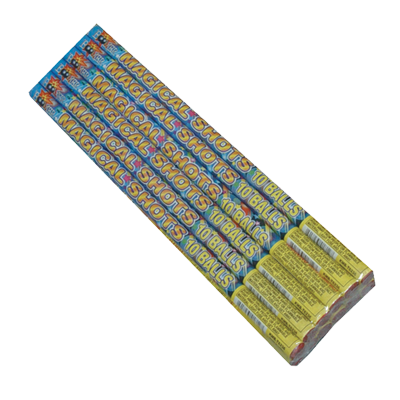 4 Assorted Roman Candles - 4 Different types of roman candles in one package. 10 Ball Roman Candles - The traditional romam candle. Shoots 10 flaming white balls per candle. 5 Ball Assorted Roman Candles - Like firing mini mortars into the sky! Each candle fires five shots into the sky that burst with various effects! Secret Weapon - 28 Inches in length with a 2 inch girth this is a large 5 shot roman candle that varies in color.